These stirrup pick earrings are simple, all-natural, and able to fit 14g or 16g piercings. The stirrup pendants are carved from sono wood for a handsome, rustic surface. 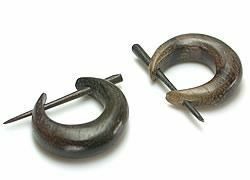 These earrings have an approximate inner diameter of 9mm and an overall height of 15mm. The Sono Wood Pick Earrings are sold as a pair.